Have you suffered a personal injury, been hurt or disabled? Are you concerned about protecting your future, and worried where money will come from to get things back to normal? 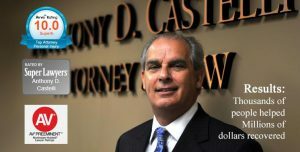 For over 30 years Cincinnati personal injury attorney Anthony Castelli has helped hundreds of injury victims. Call on his help today to seek full compensation. You don’t pay a fee unless you get your money damages paid. Selected by peers as one of the Super Lawyers®.